One category most Portland Oregon homeowners hope that they never find themselves doing a web search for is roof repair. In most situations, roof repair needs only comes after there has been water leaking into your home. Many different things can be the cause of a leaky roof. 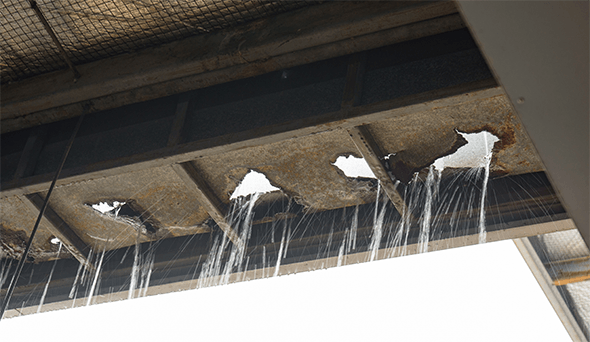 Sometimes a roof leak is the result of a worn old roof that has exceeded its serviceable life. It has simply deteriorated and is no longer an adequate water barrier. At other times, the leaky roof is a result of an act of nature, such as a falling limb. Then there is the most troubling occurrence – when an otherwise good roof is leaking. A problem with a vent or flashing is the most common areas of roof leaks. If you think about it, it makes sense. Two different materials are merging at roof flashings and vents: your roofing material and a metal flashing or vent. Both materials have the same goal of keeping your roof waterproof, however, being different materials, they don’t automatically blend together and need other methods to prevent roofs from leaking. The most common method typically used is a system of adequate overlapping, so that a piece of venting or flashing goes far enough under the roofing materials so that water will not run back up underneath it. While you might think that there is a lot of sealing or caulking used to waterproof a roof, generally not that much is used in relation to the volume of the entire roof. Skylights, another common leak area, are waterproofed by one piece of flashing being snug against another flashing piece going in the opposite direction. This forms a sideways “S” that water has to travel in order for a leak to occur. Generally, water will not rise upward when gravity is pulling it downward. Vents and flashing can, however, occasionally loosen up and get out of position. Once this occurs, the immediate area becomes susceptible to leaks. Replacement or Repositioning of the subject vent or flashing is required. 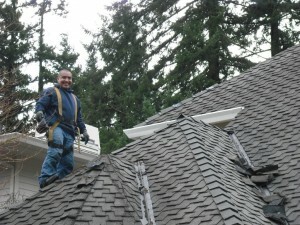 One area on the roof that usually require some sealing in addition to flashing is the chimney. Caulks and sealants are subject to deterioration from their constant exposure to UV rays water. Resealing such areas is periodically required, preferable in advance of a leak. A free 20 point roof inspection from All Surface Roofing will help spot any such issues. There are times, especially when there is a roof leak not related to the vents or flashing, that the leak is the result of a poor architectural design. When too large of a water volume is directed to too small of an area, the roof system is taxed. Backflowing may happen that exceeds what the roof system was designed to handle. In these situations, parts of roofing may need to be removed, supplementary layers of underlayment barriers added, and then new roofing installed. Usually the result of high winds or loosened fasteners, missing roofing material is one of the most visually obvious signs of needing roof repair. There is not much ambiguity in this situation. The real moisture barrier of your roof system, the underlayment, typically will prevent leakage until a roof repair can be done. Quick action is nonetheless required in order to guard the underlayment from exposure damage. Last but not least, there are leaks caused by snow and ice dams. While Portland Oregon rarely has long stretches of severe weather, dams can still occur occasionally. Water that normally flows harmlessly down the roof can be suddenly blocked from doing so. At this point, water starts to back up. What is unique about this type of a leaky roof is that no permanent roof damage is usually caused (however, interior damage might occur.) Once warmer weather returns and the dam breaks, there is not an ongoing issue that needs to be addressed. Since you or no one else can’t be on your roof during such weather, it is the one situation where if you can’t break the dam from a safe spot, you have to live with a bucket under the leak until the situation corrects itself. If you are lucky, possibly the dam can be reached and dislodged from the ground with an extension pole.